Thanks for your interest in WOTOFO VAPOR. The Starbuzz EHose, the newest innovation in electronic hookahs and e-vaping. You can take this ingenious device anywhere and it gives you an authentic hookah smoking experience in the palm of your hand. Each Starbuzz Ehose will come with 2 Blue Mist flavor cartridges as well as a standard 110v AC wall adapter (compatible for use internationally). Sporting the same fashionable design and reliability of it's predecessor. The Mini E Hose stands about half as tall as the regular E-Hose. Now you can vape the same E-Hose cartridges in a smaller more portable E-Hose Mini. ----Measuring 6 inches in length, the Starbuzz E-Hose is shaped like a hookah hose handle but contains an electronic vaporizer inside that delivers a smooth,tasty tabocco-free vapor that lasts up to 1500 puffs per refillable cartridge. -----The Starbuzz E-hose flavor cartridgesare identical to the original Starbuzz shisha flavors. -----The Starbuzz Ehose holds 2 cartridges and enables you to mix flavors to your tastes, just like a traditional hookah. 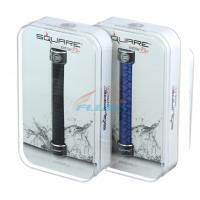 -----The E hose battery is quick to charge (the initial charge may take 2-6 hours) and lasts up to 1000 puffs.